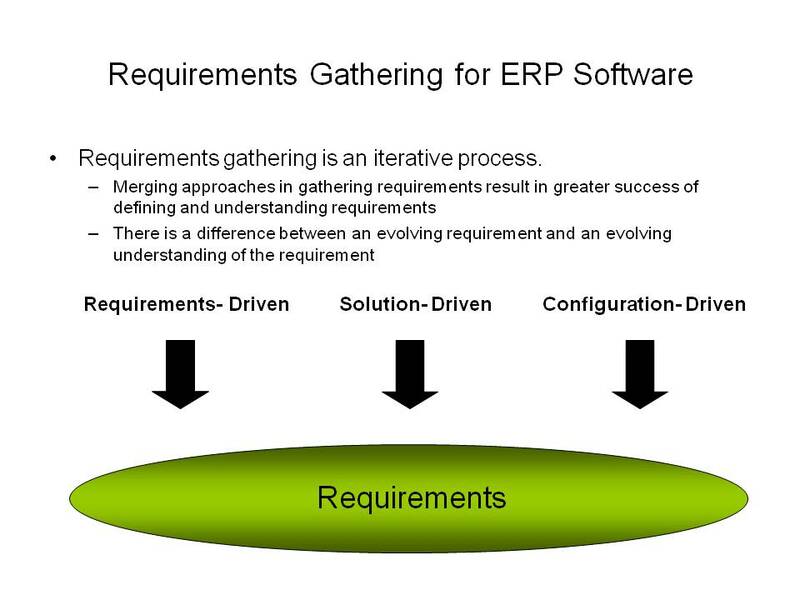 Best approach for gathering ERP requirements | ERP the Right Way! I could see a third opening option: “What problem are you trying to solve or address?” That should lead to a much more interesting problem that suggests you want to know more about the customer’s environment and issues rather than jumping into solutions. It also opens up the possibility that the solution may not involve a change to software or the implementation of ERP software. In fact, the customer’s problem may be arising from inefficient business processes improvements of which could come from a process re-design. If anything, though, this opening question give you, the IS business partner, a better idea of which requirement definition path you should follow to best meet the customer’s needs. IMHO. Hi Kevin – thank you for your response. I can see this approach working – especially for an existing ERP solution. I must admit that most of my experience is in ERP implementation and not ERP maintenance. However, I just took a job as an IT Director for ERP development. I suspect that I will learn a lot from this experinece. Thank you for the insight! Interesting post, I will send to my former Deloitte colleagues. From time to time I had the sensation that in most of the implementations we were losing some pieces of information. This is a simple approach to put all of them together, and what is most important, a good point to reflect on how we work. Regarding Kevin Brunk’s comment, it seems logical that a much more diagnotic phase is required, prior to jumping in with any formal requirement sessions. In fact, if we re-align our focus we can see that this is more than a diagnostic or “discovery” phase, but rather a Due-Deligence process. Something, which i am sure your all agree is sorely lacking in the industry. When we are talking about an ERP implementation, one of the key intangible requirement is for the custlomer to develop a trust in the consultant. The trust should include the trust on the consultant’s knowledge and more importantly a confidence that the consultant is working to help the user. Otherwise, even a simple question like (this is my experience), “what is your normal leadtime for you to receive the raw material once you place a purchase order?” could get you a highly subjective number which could throw your MRP calculations thru the window. (“Normally we get it in 5 days, but once it took about 15 days, so keep the lead time as 15”). Once you establish trust, then the approach to be decided will depend on many other technical and business factors. 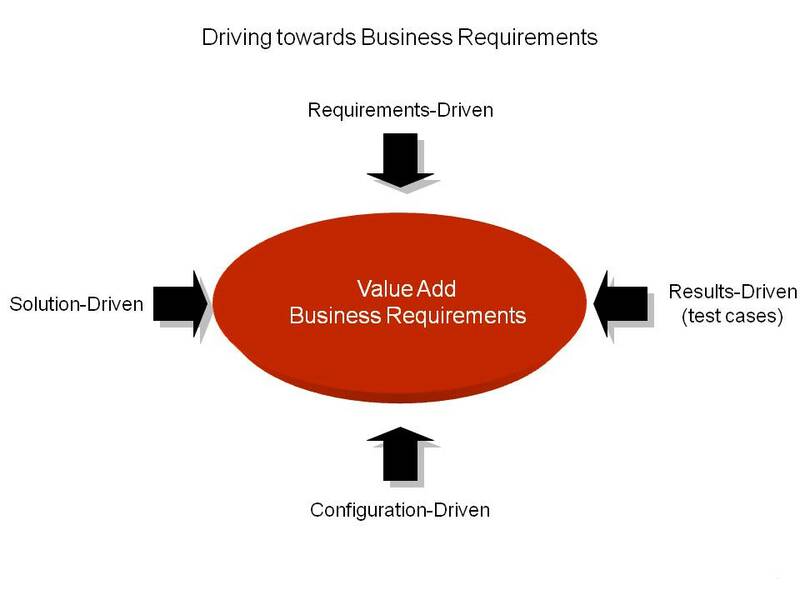 However, I prefer a combination of solution driven and requirements driven approaches. For example, in case of processes which are standardized (Statutory requirements, Financials etc) I go for a solution driven approach, while in case of other areas where the same requirement can be met with multiple options, I go for requirement driven appoach so that I can suggest the best option for the requirement. The approach covered all aspects. Imaging developing a new website for a vegetarian restaurant chain called veggie land there are currently three restaurant locations all on the north side of Seattle the restaurant chain wants to expand into the other areas of Seattle including downtown and the suburbs. What is the best requirement s gathering method to reach the targeted users near the existing restaurant locations? What about the targeted users near potential restaurant locations. Are there any community-based organizations that might be helpful with requirements gathering? Good process. I think I’ve been doing it this way for 20+ years; I assumed everyone did. I would also add two: business strategy based analysis and process based analysis. A very interesting article that brings in the required discipline in ERP implementations/engagements. We are all experiencing a transformation in Implementing SaaS, Implementers. Customers and SaaS providers”. Do I support the Solution Driven approach? Absolutely. There is alignment with the SaaS model and the Solution Driven approach. One should be adopting SaaS if they want to fit their business into the solution instead of the other way around. One of my colleagues, an Implementer put it this way – “For an on-premise deployment you start with the solution and “Create” to fill the gap between the solution and the As-Is or To-be business processes”. He says, “In the SaaS deployment model, one would “Critique” the solution and ask Why not, or why can I not run my business according to the way the solution works.” I am paraphrasing, but I’ve always found this insightful. You’ll only achieve one of the promises of SaaS, a faster, lower cost implementation, if you critique and not create. Nice Article. Though I agree with Ramaswamy , understanding the root cause is important as anything else here.